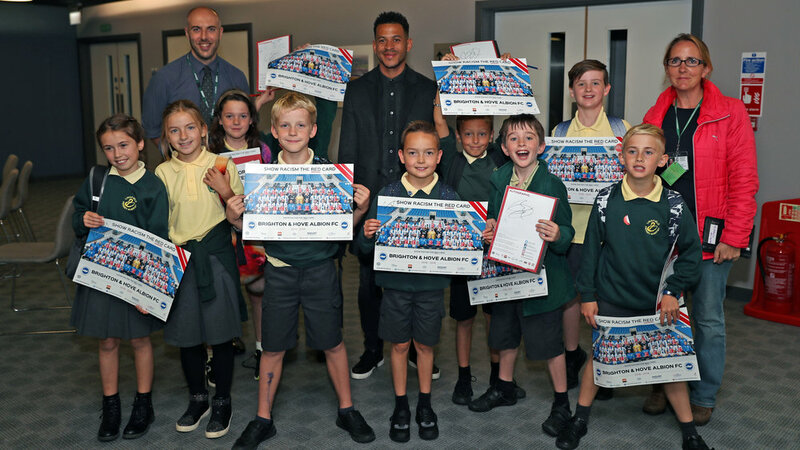 On Friday 13th October 2018, Show Racism the Red Card (SRtRC) held an educational event at the Amex Stadium in partnership with Brighton & Hove Albion Football Club (BHAFC) and Albion in the Community (AITC). 65 young people from eight local primary schools attended the event which saw the Year 5/6’s take part in a carousel of workshops, see a screening of the SRtRC educational film and take part in a Q&A session with a panel of special guests. Young people took part in three different workshops throughout the morning. SRtRC Campaign Worker, Ben Holman, conducted a workshop which helped young people explore stereotypes, think critically about the way in which we stereotype and allowed the young people to discuss the dangers of stereotyping. Education Coordinator at Albion in the Community, Frazer Simpkins, delivered a brilliant identity focused workshop. The aim of the workshop was to help the young people understand identity and the impact of stereotyping. The third workshop of the morning that the young people took part in was a stadium tour of the Amex Stadium. Staff from BHAFC took the young people on a forty-five-minute tour where they visited the home and away changing rooms, the boardroom and they even managed to get pitch-side. After lunch the young people reflected on the workshops from the morning and spoke about the key issues which has been discussed. The young people further developed their understanding by watching the new 21-minute Show Racism the Red Card educational film, which provides an excellent introduction to the subject of racism. BHAFC Manager, Chris Hughton, features on the educational film. Education Coordinator, Frazer Simpkins, sat on the panel to help answer the questions from the young people about racism. Show Racism the Red Card Southern Region Manager, Steve Goodsell, also joined the panel. Former professional footballer and BHAFC U23’s Manager, Liam Rosenior, also attended the event and sat on the panel to answer questions from the young people. Young people from each school put forward a variety of questions to the panel regarding racism. What can we do as individuals to stop racism? Is social media good for racism? Have you ever seen racism that has been said to have been a joke? Have you ever suffered racism? These were just a few examples of the questions that the panel were taking it in turn to answer. The panel explained to the young people what they should do if they experience racism and who they can report it to. The panel also provided brilliant advice on what each person can do to tackle racism. Prizes were given out to the three best questions asked to the panel. BHAFC kindly donated a signed football to the winner of the bets question asked. Show Racism the Red Card would like to thank everyone at Bright & Hove Albion FC for their support in organising the event and a special thank you to Paul Williams and Frazer Simpkins who made the event possible. The power of role-models to educate young people should never be underestimated, therefore, a massive thank you to Frazer, Steve, and Liam. A big thank you to the Professional Footballers Association who continue to support the work of Show Racism the Red Card and make events like this possible. And finally, Show Racism the Red Card would like to thank all the young people for their honest engagement from start to finish. Brighton & Hove Albion and Albion in the Community have once again shown their support for anti-racism charity Show Racism the Red Card.